The basic idea behind a bird feeder is that it needs to hold birdseed but there's more to it than that. 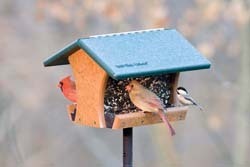 A bird feeder should not only hold seed it must also be durable enough to withstand wind, rain, and snow. I feeder should have various points to allow multiple birds to perch at the same time. 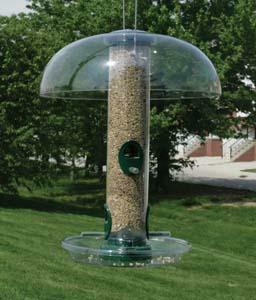 Wild Birds Unlimited in Hockessin carries a wide variety of bird feeders to accommodate most birds. A bird feeder should also be easy to clean. Sometime seed can sit too long in a feeder or weather conditions might affect the seed causing seed to clump and even mold. By cleaning your feeders on a monthly basis you can ensure that the plate they're eating off is safe. We recommend cleaning your feeders monthly in a solution of 1 part bleach to 10 parts water. This will disinfect a bird feeder thoroughly. Home > Product Highlights and Problem Solutions > What makes a good bird feeder?